TORONTO , Nov. 30, 2018 /CNW/ – Canopy Growth Corporation (WEED.TO) (CGC) (“Canopy Growth“) and Canopy Rivers Inc. (“Canopy Rivers“) (RIV.V) are pleased to announce the closing of the previously announced restructuring transaction with TerrAscend Corp. (“TerrAscend“) (CSE:TER) pursuant to which TerrAscend restructured its share capital by way of a plan of arrangement under the Business Corporations Act ( Ontario ) (the “Arrangement“). The announcement follows TerrAscend’s special meeting of shareholders held on November 27, 2018 where holders of common shares in the capital of TerrAscend (the “Common Shares“) voted to approve the Arrangement. To accommodate TerrAscend’s strategic pursuits, while also maintaining strict compliance with industry regulations and the policies of the various securities exchanges on which they are listed, Canopy Growth and Canopy Rivers Corporation (“Rivers“) agreed to restructure their investments in TerrAscend and exchange their Common Shares for exchangeable shares in the capital of TerrAscend (the “Exchangeable Shares“) that will only become convertible into Common Shares following changes in U.S. federal laws regarding the cultivation, distribution or possession of marijuana, the compliance of TerrAscend with such laws and the approval of the various securities exchanges upon which Canopy Growth and Canopy Rivers are listed. The Exchangeable Shares are not listed on a recognized stock exchange and, until converted into Common Shares, the holders thereof will not be entitled to voting rights, dividends or other rights upon dissolution of TerrAscend. Prior to the Arrangement, Canopy Growth and Rivers each held 11,285,456 Common Shares and warrants to purchase 9,545,456 Common Shares, representing approximately 11.7% of the issued and outstanding Common Shares on a non-diluted basis and approximately 19.7% of the issued and outstanding Common Shares on a partially diluted basis. Based on the closing price of the Common Shares on the CSE on the date immediately prior to the Arrangement, the value of the Common Shares and warrants exchanged by each of Canopy Growth and Rivers was approximately $133 million . Given that the growth, cultivation, production and sale of cannabis is not currently federally legal in the US and there can be no assurances that it will be legalized, Canopy Growth and Canopy Rivers expect to write down their investments in TerrAscend and record a loss in the third quarter related to the reorganization, unless circumstances change. Pursuant to the Arrangement, Canopy Growth and Rivers each received 19,445,285 Exchangeable Shares, resulting in Canopy Growth and Rivers each holding 50.0% of the issued and outstanding Exchangeable Shares. Canopy Growth and Rivers do not hold any other securities in the capital of TerrAscend. Full details of the Arrangement are set out in the management information circular of TerrAscend dated October 24, 2018 (the “Information Circular“). A copy of the Information Circular and the early warning report to be filed by Canopy Growth and Canopy Rivers in connection with the acquisition of the Exchangeable Shares can be found under TerrAscend’s profile on SEDAR at www.sedar.com or by contacting Canopy Growth or Canopy Rivers as set out below. Canopy Growth’s head office is located at 1 Hershey Drive, Smith Falls, Ontario , K7A 0A8, Canopy Rivers’ head office is located at 40 King Street West, Suite 2100, Toronto, Ontario M5H 3C2 and TerrAscend’s head office is located at P.O. Box 43125, Mississauga, Ontario L5B 4A7. Canopy Growth is a world-leading diversified cannabis and hemp company, offering distinct brands and curated cannabis varieties in dried, oil and Softgel capsule forms. From product and process innovation to market execution, Canopy Growth is driven by a passion for leadership and a commitment to building a world-class cannabis company one product, site and country at a time. Canopy Growth has operations in 12 countries across five continents. Canopy Growth is proudly dedicated to educating healthcare practitioners, conducting robust clinical research, and furthering the public’s understanding of cannabis, and through its partly owned subsidiary, Canopy Health Innovations has devoted millions of dollars toward cutting edge, commercializable research and IP development. Through partly owned subsidiary Canopy Rivers, Canopy Growth is providing resources and investment to new market entrants and building a portfolio of stable investments in the sector. From our historic public listing on the Toronto Stock Exchange and New York Stock Exchange to our continued international expansion, pride in advancing shareholder value through leadership is engrained in all we do at Canopy Growth. Canopy Growth has established partnerships with leading sector names including cannabis icon Snoop Dogg, breeding legends DNA Genetics and Green House seeds, and Fortune 500 alcohol leader Constellation Brands, to name but a few. 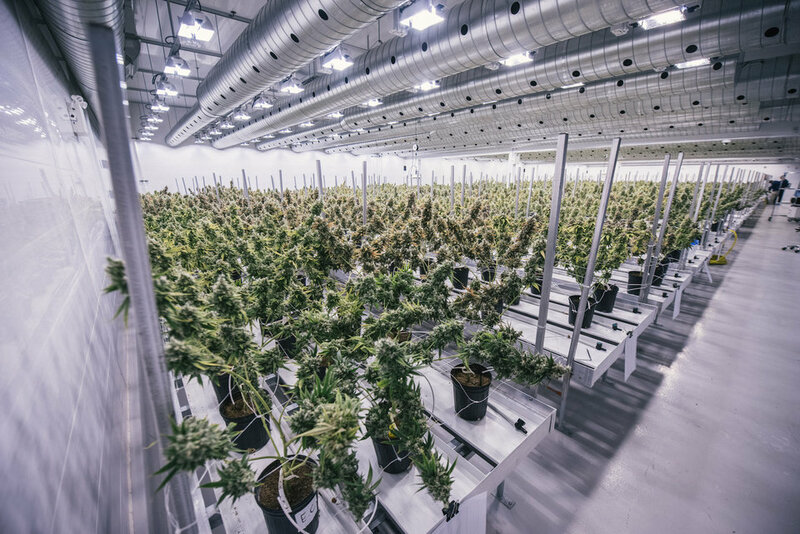 Canopy Growth operates ten licensed cannabis production sites with over 4.3 million square feet of production capacity, including over 500,000 square feet of GMP certified production space. For more information visit www.canopygrowth.com. Canopy Rivers is a unique investment and operating platform structured to pursue investment opportunities in the emerging global cannabis sector. Canopy Rivers works collaboratively with Canopy Growth to identify strategic counterparties seeking financial and/or operating support. Canopy Rivers has developed an investment ecosystem of complementary cannabis operating companies that represent various segments of the value chain across the emerging cannabis sector. As the portfolio continues to develop, constituents will be provided with opportunities to work with Canopy Growth and collaborate among themselves, which Canopy Rivers believes will maximize value for its shareholders and foster an environment of innovation, synergy and value creation for the entire ecosystem. This news release contains “forward-looking statements” within the meaning of the United States Private Securities Litigation Reform Act of 1995 and “forward-looking information” within the meaning of applicable Canadian securities legislation. Often, but not always, forward-looking statements and information can be identified by the use of words such as “plans”, “expects” or “does not expect”, “is expected”, “estimates”, “intends”, “anticipates” or “does not anticipate”, or “believes”, or variations of such words and phrases or state that certain actions, events or results “may”, “could”, “would”, “might” or “will” be taken, occur or be achieved. Forward-looking statements or information involve known and unknown risks, uncertainties and other factors which may cause the actual results, performance or achievements of Canopy Growth or Canopy Rivers or their respective subsidiaries to be materially different from any future results, performance or achievements expressed or implied by the forward-looking statements or information contained in this news release. Examples of such statements include statements with respect to the TerrAscend’s business and operations, U.S. cannabis regulatory reform, dividend payments and other distributions and expectations for other economic, business, and/or competitive factors. Risks, uncertainties and other factors involved with forward-looking information could cause actual events, results, performance, prospects and opportunities to differ materially from those expressed or implied by such forward-looking information, including regulatory and licensing risks; changes in general economic, business and political conditions, including changes in the financial markets; the U.S. regulatory landscape and enforcement related to cannabis, including political risks and risks relating to regulatory change; risks relating to anti-money laundering laws; compliance with extensive government regulation; public opinion and perception of the cannabis industry; the actual operating and financial performance of TerrAscend; risks related to the U.S. cannabis industry generally; changes in applicable laws; changes in Canopy Rivers’ relationship with Canopy Growth; potential conflicts of interest; as well as the risk factors contained in Canopy Growth’s annual information form dated June 27, 2018 and filed with Canadian securities regulators available on Canopy Growth’s issuer profile on SEDAR at www.sedar.com and in the joint management information circular of Canopy Rivers and Canopy Rivers Corporation dated August 8, 2017 , filed with Canadian securities regulators and available on Canopy Rivers’ issuer profile on SEDAR at www.sedar.com. Although Canopy Growth and Canopy Rivers believe that the assumptions and factors used in preparing the forward-looking information or forward-looking statements in this news release are reasonable, undue reliance should not be placed on such information and no assurance can be given that such events will occur in the disclosed time frames or at all. The forward-looking information and forward-looking statements included in this news release are made as of the date of this news release and Canopy Growth and Canopy Rivers do not undertake an obligation to publicly update such forward-looking information or forward-looking information to reflect new information, subsequent events or otherwise unless required by applicable securities laws. As cannabis remains illegal under federal law in the U.S., financial transactions involving proceeds generated by, or intended to promote, cannabis-related business activities in the U.S. may form the basis for prosecution under applicable U.S. federal money laundering legislation. Strict compliance with state laws does not absolve a company of liability under U.S. federal law, nor will it provide a defense to any federal proceeding. Accordingly, future business activities of TerrAscend may violate U.S. federal law and may have a material adverse effect on the business, operations and financial condition of Canopy Growth and Canopy Rivers as a result of various reputational, contractual and legal risks associated with holding the Exchangeable Shares.